This week is National Volunteer Week and we would like to introduce you to one of our volunteers, Marjorie Williams. 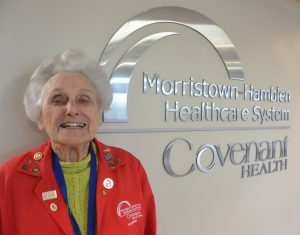 Marjorie has been volunteering for Morristown-Hamblen Healthcare System almost 40 years. Her first day as a volunteer was June 7, 1979. Before volunteering, Marjorie was a P.E. teacher at then Morristown High School for 30 years. You can find Marjorie volunteering at the hospital on Mondays in the Critical Care Waiting Room. She will greet you with a sweet smile and warm spirit. Marjorie loves to play bridge and go walking on the track at the First Presbyterian Church in Morristown. She is a proud mother and grandma. Marjorie has a daughter, Sandra, who takes great care of her as well as a granddaughter who not only is in nursing school but plays the bagpipes. At the end of her volunteer shift, Marjorie enjoys eating lunch with her fellow volunteer friends. We hope you enjoyed getting to know Marjorie Williams and stay tuned for the next Volunteer Appreciation Week spotlight. If possible, please thank a volunteer for their dedicated service. Volunteers are such an important part to Morristown-Hamblen Healthcare System.